Impastor: Season Three; Would You Have Watched the TV Land Series? In case you missed it, TV Land cancelled the Impastor TV show after only two seasons. The sitcom starred Michael Rosenbaum as Buddy Dobbs, a slacker on the run to evade his gambling debts. Thanks to some “divine intervention” Buddy assumes the identity of a small town pastor. Sara Rue, Mircea Monroe, Mike Kosinski, and David Rasche also starred. 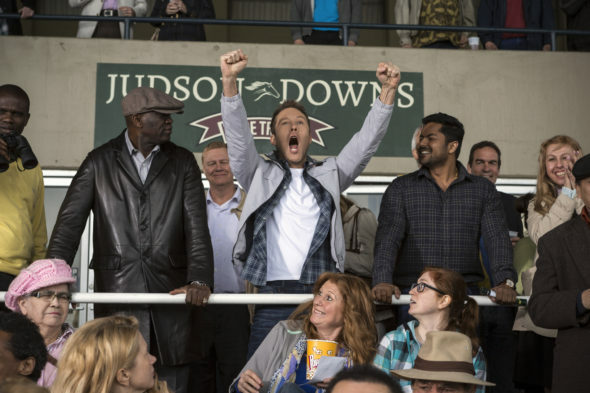 While Impastor‘s numbers were never strong, the season two ratings were particularly anemic. By the end of its second and final season, Impastor averaged a .08 in the 18-49 demographic and drew an average total audience of just 362,000 viewers. In comparison, Impastor season one averaged a 0.11 in the demo and 456,000 viewers. The show was not without its fans, however. On Rotten Tomatoes, Impastor has an 89% audience approval rating. Would you have watched a third season of Impastor on TV Land? What do you think? Are you a fan of the Impastor TV series? Should TV Land have cancelled or renewed Impastor for a third season? Were two seasons enough? Please vote in the poll and sound off in the comments. More about: Impastor, Impastor: canceled or renewed?, Impastor: ratings, Quick Questions, TV Land TV shows: canceled or renewed? Totally agree should of least had a 2 your special to wrap up the season …..people investing there time to watch the show then get ripped off at the end….not cool…..should be TVBanned cause I wont watch a single episode of whatever they offer in the future…ending on a cliffhanger…..no resolve that is dirty and uncool.. Thoroughly enjoyed Impastor! Very disappointed in it’s cancellation. A fun storyline which should have continued! A Very Good Show, SO Creative, & FRESH\NEW!…STUPIDITY TO “Cancel”…WHY? WHAT “Better” Option DO YOU HAVE!?…RERUNS!!! I enjoyed the show very much and I’m so disappointed that it was cancelled. It was one of the best comedies on tv. I miss the show and it’s unique humor. Please reconsider your decision to cancel and bring it back……I need a good laugh! It was an awesome show. So funny and distinctly different from anything else on. Needed more promotion. Too many of my friends had never heard of it. But, they did a great job acting out the story line. I will miss it dearly. This was my most favorite show hands down. So incredably creative, I was shocked to see it go…BRING IT BACK!!!!! There are four of us who vote to bring back Impastor–PLEASE. We loved it!